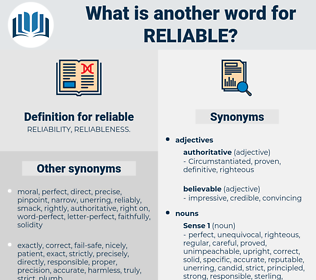 What is another word for reliable? stable, plausible, feasible, accountable, creditable, authentic, verifiable, trusting, valid, safe, sustainable, knowledgeable, responsible, acceptable, assured, workable, affordable, suitable, serious, faithful, correct, effective, sound, dignified, reasonable, worthy, meaningful, honest, available, precise, proper, true, reassuring, fair, authenticated, respectable, convincing, decent, relevant, definitive, confidence-building, valuable. authoritative, viable, reputable, predictable, believable, robust, solid, well-informed, truthful, reliability, confident, consistent, strong, certain. fraudulent, irresponsible, indefinite, soft, false, broken, unstable, unsteady, intermittent, unfixed, corrupt, dishonest, vulnerable, bad, unsuitable, undependable, untrustworthy, unreliable, deceptive, inadequate, weak, unreal, wobbly, uncertain, unsure, evil, unrespectable. unsafe, counterfeit, lying, unauthorized, suspect, shaky, shady, fictitious, dodgy, fabulous, disputed, hazardous, debatable, Doubtable, exploded, questionable, untried, apocryphal, disputable, baseless, unconfirmed, problematic, spurious, deceitful, risky, mendacious, dubious, untrusty, fishy, doubtful. But the clock might not have been a reliable witness. True; but servants are not always reliable, and I thought I had better see one of the family. roly-poly, rule of law, reliably, royal blue, roleplay.